Patsy Eileen Snider Underwood, 72, of Bassett, VA passed away on Thursday, November 15, 2018. She was born on January 11, 1946 to the late Stanley Sylvester Snider and Flora Pettit Snider. In addition to her parents, she was preceded in death by her brother, Jerry Michael Snider. Mrs. Underwood was a member of Smith Memorial United Methodist Church in Collinsville, VA and she worked as a teacher at Ridgeway Elementary School and later at John Redd Smith Elementary School. She is survived by her husband of 49 years, Curtis Edwin “Eddie” Underwood of the residence; two sons, Jeff Underwood and wife Jodi of Collinsville, VA and Greg Underwood and wife Jessica of Martinsville, VA; sister, Jennifer Snider Shields of Waynesboro, VA; brother, Jimmy Morgan Snider of Charlottesville, VA; two grandchildren, Jessica Nicole Underwood and Joshua Luke Underwood, both of Collinsville, VA; and two great-grandchildren, Trevor Lee Bradner and Raylyn Eileen Mullins, both of Collinsville, VA.
A funeral service will be held at 1:00 p.m. on Monday, November 19, 2018 at Smith Memorial United Methodist Church with Reverend Kameron Wilds officiating. A visitation will be held from 11:00 a.m. to 1:00 p.m. prior to the service at the church and other times at the family home at 257 Tahoe Drive, Bassett, VA 24055. In lieu of flowers, memorial donations may be made to Smith Memorial United Methodist Church, 2703 Daniels Creek Rd, Collinsville, VA 24078 or to Tackfully Teamed, 7975 Henry Rd, Henry, VA 24102. To send flowers or a remembrance gift to the family of Patsy Eileen Snider Underwood, please visit our Tribute Store. And other times at the family home at 257 Tahoe Drive, Bassett, VA 24055. 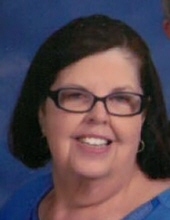 "Email Address" would like to share the life celebration of Patsy Eileen Snider Underwood. Click on the "link" to go to share a favorite memory or leave a condolence message for the family.